Natsume has always been an outcast because he inherited his grandmother Reiko's ability to see yokai (strange beings that are invisible to most people). 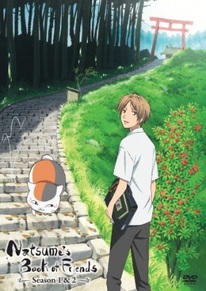 After moving to his grandmother's hometown and accidentally releasing a yokai who was imprisoned in a Lucky Cat statue, he learns about one of his grandmother's keepsakes, her "Book of Friends," which contains the names of the yokai she defeated, and allows its wielder to command the yokai named within. Since then, his life has gotten much more hectic, and yokai now visit him on a daily basis, seeking to either get their names back or take possession of the Book of Friends. Contains episodes 1-13 of season 1 and episodes 1-13 of season 2 plus a story guide leaflet. Special Features: Clean Opening & Closing, Japanese Commercials for Season 1 & 2. Due to license restrictions, this item cannot be shipped to Japan.